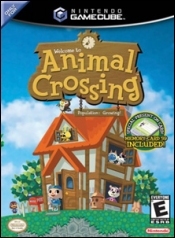 Compleate guide to Animal Crossing covering the basics, home and town maintenace, and interacting with other Animal Crossing players. All of the NES games available in Animal Crossing, how to play them, and how to find them. A list of all the cameos from other Nintendo series found in Animal Crossing. Images of all the animals and other characters in Animal Crossing. Images of all the Animal Crossing related toys, dolls, figures, and other products. Game clips, trailers, commercials, and other movies from Animal Crossing.